Weggefährten is a German word that roughly translates to companions. I was approached by my client, Nadja to create a Coptic binding for a series of letters and collaged pages to present as a gift for her partner’s 40th birthday. 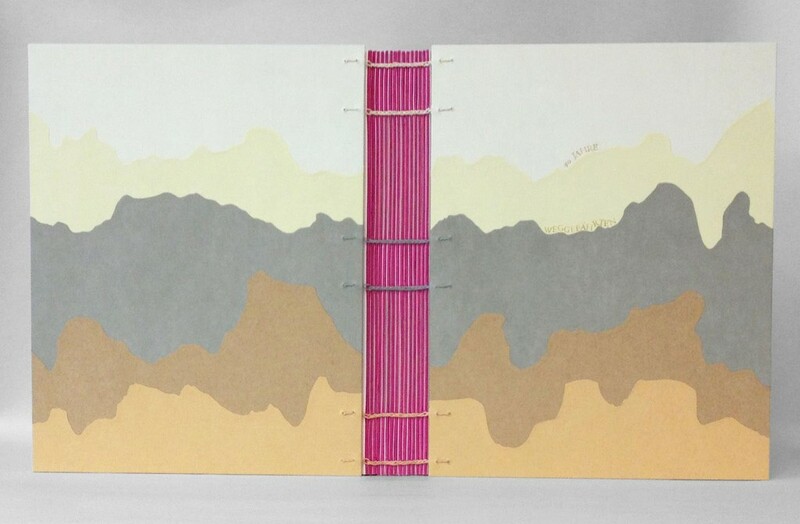 Each page was submitted by someone who had made a meaningful connection with her partner during the course of his life. The ‘mountainous’ landscape on the covers was chosen by my client from a previous design I had done. She enjoyed the organic quality of the design and how it mimicked the pathways of life. 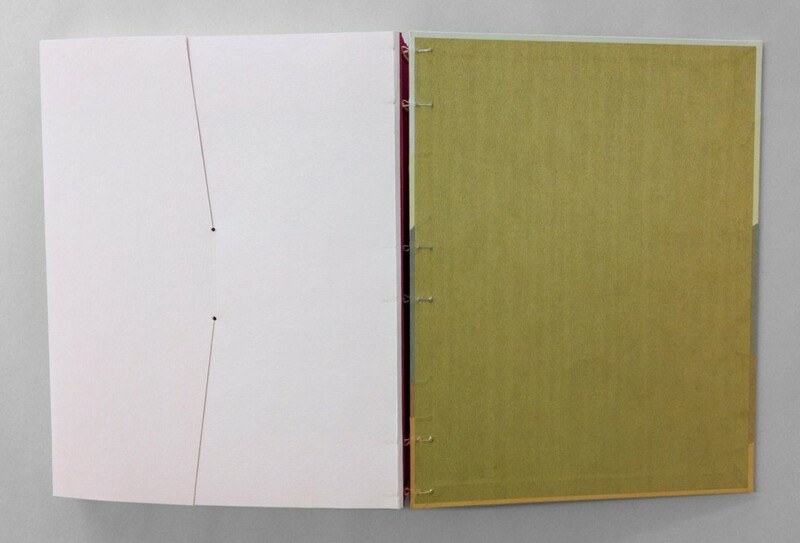 When I originally covered a Coptic in this manner, each section would overlap and turn-in at the tail of book. This created a very bulky edge at the tail of the book that was five layers thick as oppose to only one layer at the head. In order to avoid that excessive bulk, I cut each color section to the sized required. Once I drew out the design I was able to trace the shapes onto the paper, building in for turn-ins and a 2mm overlap. I used various shades of Hahnemuhle Ingres to create the design. The Coptic was bound with hand-dyed linen thread to match the shade of Ingres at the six sewing stations. 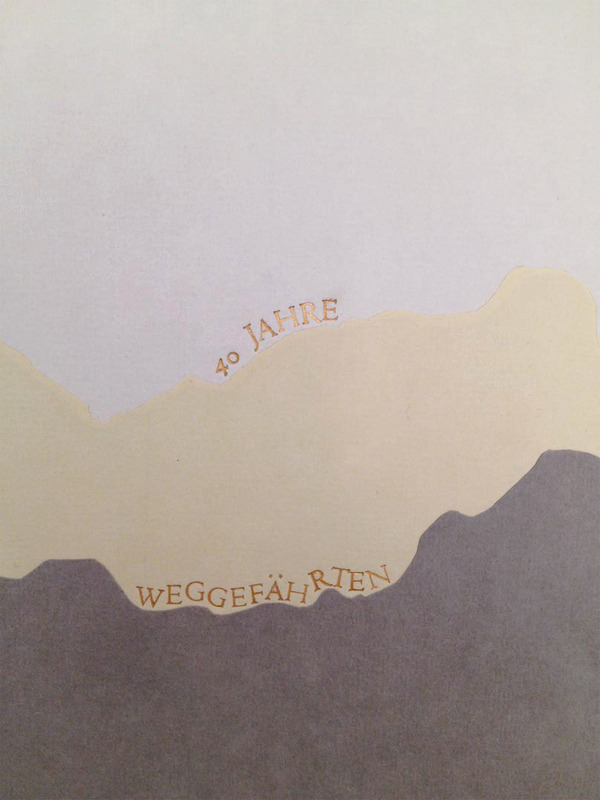 In addition to Weggefährten, the Coptic was also stamped with the phrase 40 Jahre, which translates to 40 years. The words were individually stamped with brass handle letters to follow the horizon of the pathways. In order to do this irregular stamping on paper, I first trace the line my word will follow onto tracing paper. I place a piece of gold foil onto the cover, then lay down my piece of tracing paper. The hot tool stamps through the tracing paper and the gold foil. I do not remove either layer until the word is complete, this allows me to easily see where to stamp the next letter. The color scheme of the book was quite surprising with pops of color and metallics in unusual places. The fold of each signature was highlighted with a bit of magenta Lokta to contrast with the subtle tones of the Ingres. The paste down is a gold metallic paper, which pairs nicely to the pale pink fly leaves. In addition to the single pages of letters and collages, was a seven page comic and CD. Using the same pale pink paper as the fly leaf, I included a 4-flap enclosure at the end to house these additional pieces of reverence. 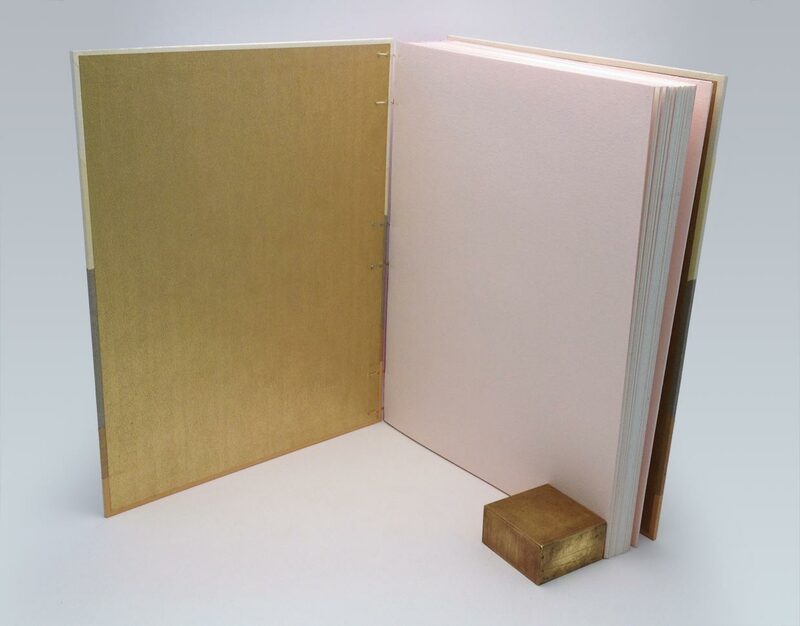 The entire book is enclosed inside a magenta 4-flap enclosure for protection. It was incredibly enjoyable to work on this project because it was outside my usual flow of work. The client’s reaction was ecstatic as she saw her vision come into being and couldn’t wait to present it to her partner. Check out more Custom Projects at Herringbone Bindery.